Video clip synopsis – Wattie Creek entered Australian folklore as the birthplace of the Aboriginal land-rights movement when Prime Minister Gough Whitlam visited the Gurindji people to grant them deeds to their land. Broadband MP4 wattie_bb.mp4 (18.8MB), suitable for iPods and computer downloads. 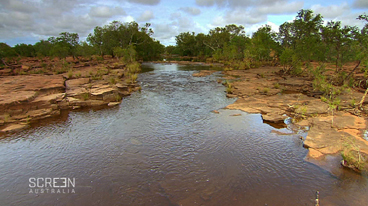 Wattie Creek is an episode from the series Australia’s Heritage – National Treasures with Chris Taylor, produced in 2009. Before the 1967 referendum the Australian Constitution prevented the Australian Government enacting policies for Aboriginal people at a national level. Policies and approaches to Aboriginal legal status, employment and living conditions were implemented under different state and territory administrations without national coordination or national responsibility. This resulted in a pattern of neglect, dependency and marginalisation, where Aboriginal Australians were highly vulnerable to exploitation. Anthropologists Catherine and Ronald Berndt surveyed Aboriginal labour on Vestey’s pastoral leaseholds in the Northern Territory between 1944 and 1946. Vestey’s was a British business group, the largest international meat producer in the western world. They leased the Wave Hill cattle station. The Berndts documented appalling working conditions, squalor and poverty in many of the camps, and endemic malnutrition and high infant mortality rates. They reported widespread dissatisfaction and resentment of working and living conditions on pastoral stations. Indigenous accounts of ill usage, extremely limited life chances, degrading treatment, racial and sexual abuse were documented. Further, in the 1950s it was found that in the Northern Territory Aboriginal stock workers received less than 15% of the basic wage. The immediate impetus to the Wave Hill walk-off in August 1966 by the Gurindji people, the traditional indigenous landowners, was the March 1966 decision by the Conciliation and Arbitration Commission to delay the payment of award wages to male Indigenous workers in the cattle industry until 1968. The walk-off concluded in March 1967, where the Gurindji settled at the place they named Daguragu, on Wattie Creek. Their plan was to establish a pastoral operation and community run under their own leadership, on their traditional lands, to be owned by them. This model combining Aboriginal autonomy and land rights shaped Australian government policy following the 1967 referendum. Describe the conditions experienced by the local Gurindgi people over many decades that led to their ‘walk-off’ from Wave Hill cattle station in 1966. Explain the significance of the naming of Daguragu, at Wattie Creek, and of the events that occurred there in 1967. Why is Vincent Lingiari known as ‘the father of landrights’ in Australia? Draw a map of the Northern Territory showing the locations of Wave Hill, Daguragu and the water course of Wattie Creek, in relation to other places such as Katherine, Darwin, Alice Springs and Kakadu. Construct a second, small-scale map of the route of the walk-off from start to finish, adding the dates and locations of each section of the journey. Based on the program and from further research, create a poster display of a timeline of important events in the history of Aboriginal land loss and land rights from the early decades of the 20th century to the present. Add illustrations and explanatory text as required. In pairs or small groups research and write a commentary on the development and progress of Gurindgi land control and usage since the initial 1975 breakthrough landrights document was signed.